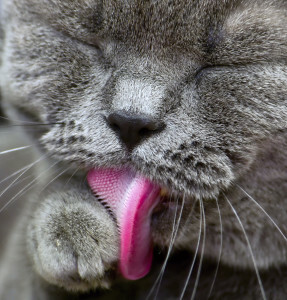 Cats drink by converting their long tongues into spoons. The tip of the tongue is curled backward to create a hollow shape that acts like the bowl of a spoon. 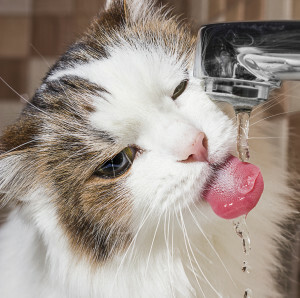 The cat actually drinks by curling the upper side of the tongue downward and then darts it across the surface of the water at a remarkably fast speed. This causes a column of water to rise up and the cat closes his mouth just in time to collect it before gravity allows the water to fall back down. The cat swallows after every fourth or fifth lap, when enough liquid has accumulated at the back of the mouth. The barbs, or papillae, on the tongue soak up the liquid like a sponge. They are raspy and are also designed to rip the meat off of bones. (If you have been licked by your feline friend, you already knew this.) The backward-pointing barbs serve to move food and water into the cat’s mouth, but they can also make it difficult for the cat to remove a piece of string or yarn from its mouth. (Always check your house and their toys for potential hazards).